Alex Yeh, Business Development Manager, Northern Micro (left) accepts the Client Solutions Provider of the Year Award on behalf of Northern Micro, presented by Deanna Thomson, National Director, Channel Sales, Dell EMC Canada (right). Providing solutions to verticals like the government and education is no small feat for channel partners, but Ottawa-based Northern Micro has excelled in this space. 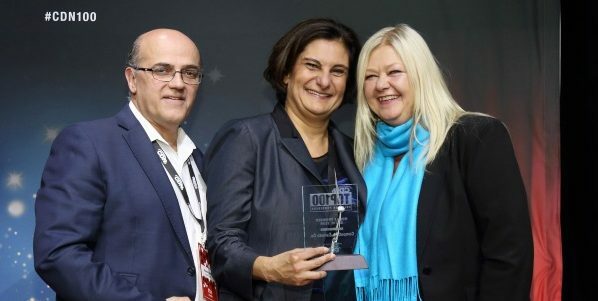 As a result, the IT solutions company has won the first-ever Client Solutions Provider of the Year Award at CDN’s annual Top 100 Solution Providers gala, which was held in Toronto on Apr. 25. This award recognizes the top performing companies in important niches within Canada’s computer industry. Northern Micro works almost exclusively with governments and the P-12 education sector, serving up products and services like converged infrastructure, data storage, networking solutions, and a wide range of devices. The company was also ranked the 14th largest solution provider in Canada on the Top 100 list, which is based on yearly revenue in the country. Northern Micro has extensive experience in change management, business processes, and industry-leading technologies. It is a registered partner with companies such as Microsoft, HP Inc., HPE, Intel, Cisco, and Dell EMC. In fact, it was recognized as a Dell EMC Partner of the Year, winning the North American Shining Star award at the company’s Global Partner Summit on May 2 in Las Vegas. Dell EMC Canada’s national director of channel sales Deanna Thomson says that the company leverages best practices and “goes the extra mile” to meet its clients’ needs. In 2017, the popularity of Chromebooks and Surface Pro products drove triple-digit increases in some of Northern Micro’s education verticals. It also enjoyed great success with the province of Quebec and deepened its roots with the federal government. It provided a new blockchain-optimized connected vehicle platform for the Quebec Provincial Police, as well as alternative laptops for law enforcement and military verticals across the country. While the company was acquired by Converge Technology Partners in November 2017, Northern Micro will continue its strategy of “providing best of breed technology solutions from the endpoint to the data centre for its customers in the Canadian federal government and education sector”, according to a Nov. 10 press release.